The Troll is dead. 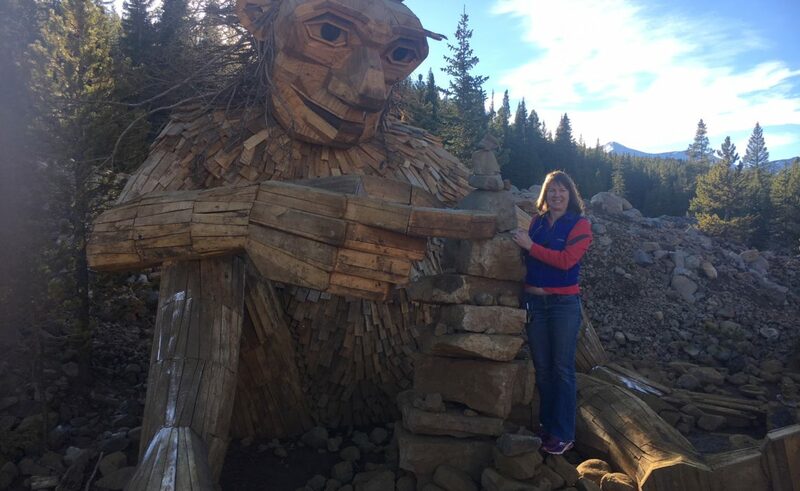 Three weeks ago, I wrote about a unique piece of art located on The Wellington Troll in Breckenridge, Colorado. The troll was located on a walking trail near a residential area of new build town homes. Because of its popularity, it had attracted large numbers of visitors. I’m so happy I got the opportunity to witness it up close and personal. The fact it had been entirely composed of natural elements — wood and stone — just added to its artistry. I had returned to my home town wishing we could bring him to Nederland. When I heard the town council in Breckenridge had given it a reprieve from being remove, I was happy more would received the joy and inspiration of viewing him. Alas, it is not to be. Supposedly the neighbors complained of noise, trash and other problem associated with the troll. When I visited, I saw none of these things. People stuck to the trail and acted like most hikers in Colorado in being quiet and respectful of the natural surroundings. Nor did I see a single speck of trash on or near the trail. Yet, three weeks later, this past Thursday, a backhoe and chainsaw were used to take down Thomas Dambo’s magnificent piece of art. The town council voted 5-2 to remove the troll, citing public safety concerns. In my heart, I believe they succumbed to the will of its residents, who apparently don’t deal with sharing nature with others. Years ago, I wrote a piece about how different Colorado’s mountain towns are from each other. Some are authentically low-key and down to earth, and others have been taken over by the rich and famous, their history long forgotten. Vail and Aspen used to be mining towns, and 50 years ago could be enjoyed by almost all. Now, they are so expensive that local workers must commute from over an hour away to work there. Their pretentiousness and artificial quaintness don’t feel real, and I for one don’t enjoy spending time there. I fear Breckenridge is quickly going down that same path. Property values are escalating, and the town is feeling more like a Vail village every day. This latest episode with the Troll sculpture is just another example of the exclusionary attitude of the town coming out. A sculpture meant to enrich the lives of all, to encourage people to get outside, walk a trail and admire something extraordinary was taken away. Take away by people who feel like sharing a piece of their natural backyard that existed far before their townhome was built is not allowed. I treasure Nederland because we aren’t that kind of town. We welcome one and all, the poor, the quirky, the weird. I can’t help but wish Thomas Dambo had instead installed his troll in Chipeta Park along the Rim Trail, where it would have stayed until nature destroyed it, instead of a backhoe.